Definitely the best CLE I have watched. The unique presentation, real life scenarios and humor made it definitely a cut above the rest. - EUGENIA B. The format for presenting and discussing the ethics and decision-making was unique and very useful. The real world dilemma was helpful to highlight the issues practicing attorneys face day-to- day. The attorney panel was engaging. - Jacquelyn R.
Definitely the best CLE I have watched. The unique presentation, real life scenarios and humor made it definitely a cut above the rest. - Tamara L.
I thought this was a great course. It was very applicable to daily life and the ethical concerns that may occur regularly. - Rebecca H.
Very real discussion of the effect of stress on one's practice-- excellent approach. - Shelia M.
The most engaging and pertinent ethics presentation I have seen. - Julie H.
Best professionalism program I've ever seen! Lively, good real world examples, helpful discussion of how to handle or prevent common pitfalls. Highly recommended. - Carrie D.
This program was very well presented and the panelists provided very useful insights for dealing with pressures that come up every day. - Maury J. Excellent! Not a simple lecture on "do this, don't do that," but discussion of the events and mindset leading up to an ethical conflict. - Patrick P.
Great format, creative and interesting! - Gregory L.
Excellent format. The panel discussion was a helpful way to convey perspectives and information. More courses would benefit from this type of format. - Suzanne L.
Excellent film segments and panel discussion! Very HUMAN. One of the best CLE programs I have taken. 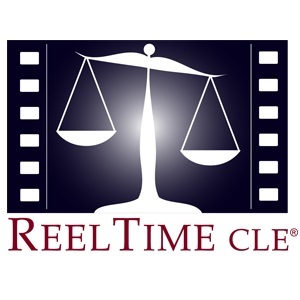 Will look for more ReelTime CLE programs. - Alan F.